يقع Citigate Motel على بعد 5 دقائق فقط بالسيارة من وسط الحي التجاري ومركز الترفيه في نيوكاسل، ويوفر غرفًا مكيفة مُزودة بتلفزيون مع قنوات الكابل مجانًا وخدمة الواي فاي المجانية ومواقف مجانية للسيارات في الموقع. تحتوي جميع الغرف على مكتب وميكروويف وثلاجة ومرافق صنع الشاي والقهوة. كما تحتوي جميع الغرف على حمام داخلي خاص مع دش. 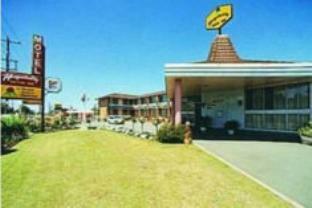 يقع Citigate Motel Newcastle على بعد 15 دقيقة بالسيارة من شاطئ نوبي ومنارة نوبي. يقع مطار Williamtown Newcastle على بعد 20 دقيقة بالسيارة. يُرجى إبلاغ Citigate Motel Newcastle بالموعد المتوقع للوصول مُسبقًا. ويمكن استخدام خانة الطلبات الخاصة عند الحجز أو الاتصال بمكان الإقامة، وذلك باستخدام بيانات الاتصال الواردة في تأكيد الحجز. يُرجى الملاحظة أن مغسلة الضيوف مُغلقة بسبب أعمال التجديد. Lovely motel with immaculate rooms and a very welcoming host. Couldn’t find fault at all. We only stayed overnight and had an upstairs triple share room which was perfect for us. Tea/coffee making facilities as well as a microwave and fridge. Fabulous shower with hot hot water. Close to food options and short drive to all Newcastle beaches. Would definitely stay again. Had a good stay there. Staff were helpful. Clean and spacious. If I had to be picky the exhaust fan in the bathroom is very loud, but it is not a big issue. Hotel was nice and clean. Ideal for a weekend getaway if you are looking at sight seeing. Arrived in Sydney in early afternoon and drove all the way to Newcastle. Dead tired once arrived but the people managing the front desk is very friendly. So it help to perk up my tired body. Also recommend the places to visit the next morning. Room is big and clean. very comfortable, clean, friendly staff.